Gyrojets, Finjets, Lancejets, Javettes, less-lethal ... Here you will find information describing the first-ever book about the miniature rockets invented by Robert Mainhardt and Arthur T. Biehl, Ph.D., in 1960 when they co-founded MBAssociates (MBA). 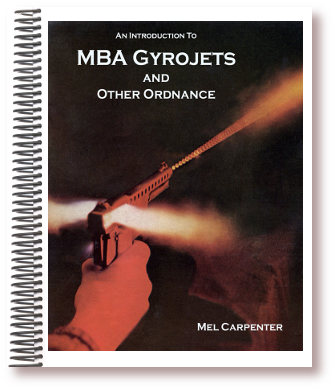 “An Introduction to MBA Gyrojets and Other Ordnance,” by long-time Gyrojet researcher, historian, collector, and Mainhardt confidant Mel Carpenter, covers the development of Gyrojets, Finjets, Lancejets, Javettes, Flares, Less-Lethal ammunition, etc. and the experimental, prototype, test, and production firearms (some of which were unknown until now) and launchers – over 60 of them – that fired them. After nearly 10 years of research, including over 50 hours of face-to-face interviews of Robert Mainhardt and phone calls; interviews of MBA and other Mainhardt company employees; careful review of once-classified government and company publications, films, audio recordings, articles, U.S. Senate public hearings transcripts, correspondence, and contracts; plus close examination of thousands of miniature rocket specimens, firearms, and launchers, the story of these fascinating rocket weapon systems is finally being told, with many myths and other incorrect information about MBA’s firearms and rockets being set right. The 8.5 x 11 inch spiral-bound book has 422 pages, 286 with color. There are 466 color and 279 B&W figures. All Gyrojets, Finjets, Lancejets, Javettes, and flares up to and including 40mm are shown at actual size, as are .38-caliber and 12-gauge less-lethal rounds. The book covers every known Gyrojet rocket ever made, from 2.8mm up to 55mm, plus the 0.030-inch Javettes for the “CIA Dart Gun” with their biological or chemical payloads. 2018 Gyrojet.net. All rights reserved.